Successfully Added ILIFE A4S Smart Robotic Vacuum Cleaner Self Charging Remote Control Anti-Collision Robot Sweeper for Home(EU Standard) Gray to your Shopping Cart. 1000Pa Super Suction can help you save energy and time. Powerful intelligent cleaning, and multiple cleaning modes for your free choice. The coverage size is 180 - 200 square meters. The noise is less than 65dB, it will give you a quiet room. It is easy to deal with all kinds of environment. Suitable for the floor, cement, ceramic tile, wooden floor, undercoat carpet, etc. 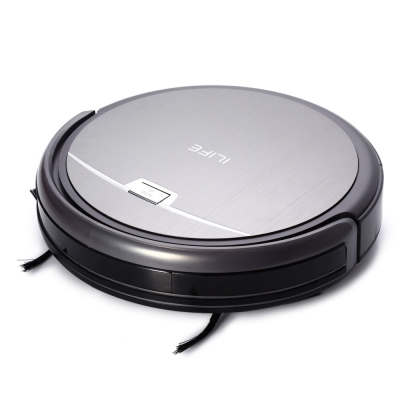 ILIFE A4S Intelligent Robotic Vacuum Cleaner is an essential household cleaning machine. You deserve to own it. Automatic cleaning for home and office, with large cleaning area: 180-200 square meters. Smart cleaning modes, it can meet your different needs. Anti-collision system, it can better protect the furniture. OBS sensors, 1 set wall sensor, 5 IR receivers on the body, this robot vacuum cleaner can recognize the barrier and avoid the collision. Intelligent drop avoidance induction, IR sensors at the bottom detect the high gap, avoid the dropping. It can avoid the obstacles and change direction automatically by inductor daily/schedule cleaning plan available. A timing function, you can set up the time to clean the room, and make the cleaning at the fixed time even you are not in a home. 76mm slim design, this cleaner can work in the narrow places, it is easy to clean the area under furniture, and the corner. Low noise design, the noise is less than 65dB, no worry about the noise problem. 1000Pa strong suction, easy to absorb dust, hair, paper, reduce the pollution of PM2.5. Two charging modes: automatic charging and manual charging. and multiple cleaning modes: automatic cleaning, border cleaning, spot cleaning, schedule cleaning and maximum cleaning, mini-room cleaning. Remote control with LCD display for easy operation, LED indicators on product showing the working status, suitable for the floor, cement, ceramic tile, wooden floor, undercoat carpet, etc. Easily deal with all kinds of environment, the remote controller is powered by 2 x R03P AAA battery (included, 1.5V/4700mAh).